Your website is one of the most important pieces of your business. It is the center of all your marketing activities and often is the first thing your leads visit when they want to learn more about your business. A successful and high converting website is not something that happens overnight. A well thought out web design plan must be developed based on your company’s goals, unique selling proposition, and ideal customers. One of the first steps you must take when creating a web design plan is to develop a buyer persona for your ideal customer. This will allow you to learn who you are trying to attract and what you need to include on your site to accomplish it. After you have figured out who you will be trying to attract, you can then begin to create goals and a strategy for your website, which along with an inbound marketing strategy, will be the basis of your plan for a high converting website. How Do I Create a High Converting Website? 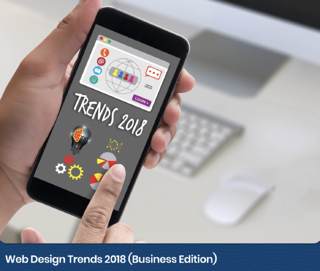 One of the best ways to ensure you have a high converting website is to do some research on current trends in web design. These trends usually stem from new technologies and customer demands for speed and simplicity. By incorporating current web design trends into your site, you can not only stay up to date with other sites, but also possibly stand out from competitors who have not incorporated current trends. Even if you have a recently created website, it is beneficial to stay current on web design trends to always ensure your website meets the needs of today’s customers instead of yesterday’s customers. Learn more about current trends in business web design here. How Much Will My Ideal Website Cost? If you have a larger company and you need an e-commerce site with many products, your site will cost significantly more than a small business with limited products and revenue. You also must consider any additional work you need done by the web design company. Any strategy building, marketing activities, or media/content creation will add to the cost of your website. 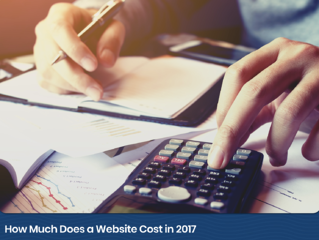 Learn more about the costs associated with a web design project here. 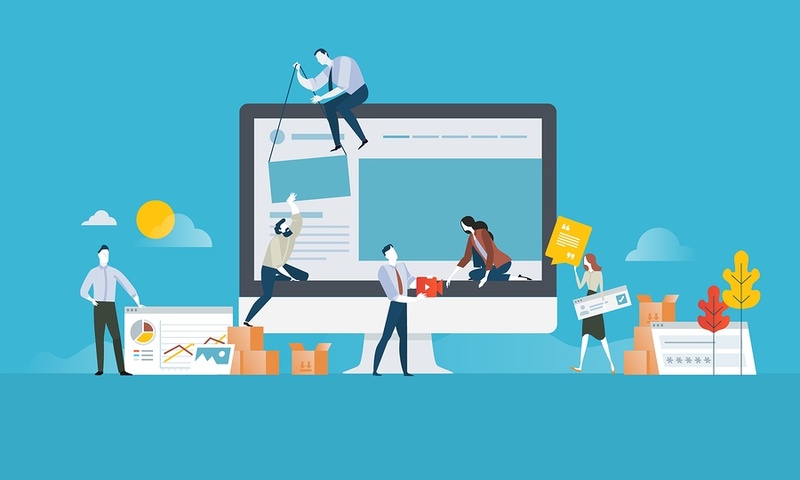 Some companies, especially small or startup businesses, do not have the ability to allocate a large amount of resources to a web design project. While this is reasonable and understandable, you must realize that a lower budget may mean not being able to work with a larger agency or receive all the services you desire from a web design company. You have a few options when it comes to web design for a smaller budget including hiring a freelance designer, contracting work with an offshore company or even trying to design a site yourself. Each of these options have pros and cons, so make sure you do your research before hiring a company to help you design a website on a small budget. 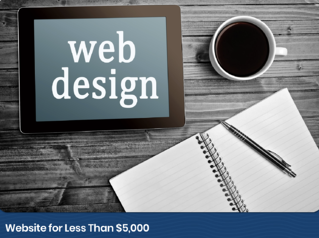 Learn more about web design options for lower budgets here. How Do I Choose a Web Design Company? After you have decided on a budget and basic goals for your web design project, you will then need to choose a company to help you complete the site. We recommend researching different companies before trying to get a quote over the phone. The reasoning behind this is you need to decide which kind of web design company you need before choosing the one that is the best for you. Each type of agency has different abilities to offer your company for your web design project. You will save yourself a lot of time by deciding which type of agency is the best fit for you before you get quotes for your web design project. 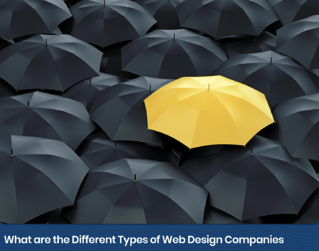 Learn more about the different types of web design agencies here. What Should Be Included on My Website? Although you are hiring a company to build your website for you, you should still be involved in your site’s overall goals, the strategy behind your site’s development, and the content that is put on your site. We often see common mistakes made in web design projects because businesses did not communicate correctly with their web design agency. By expressing where you feel your old site fell flat and what you would like to get out of your new website, your web design agency will be able to give you an accurate picture of the price and time that will go into developing your new site. Learn more about the common web design mistakes to avoid here. 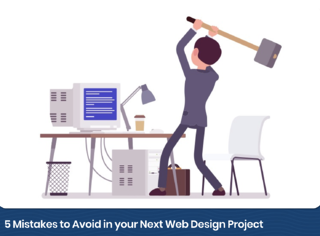 Now you know what not to do with your next web design project; let’s talk about what should be included on your website. When visitors and leads view your website, they are looking for answers or solutions to questions or problems they may have. Your website should be able to answer these questions for them and interest them in learning more about you as a company. Can you do what you say you can do? If you can produce a site that answers these questions, you will be well on your way to having a successful, high converting company website. 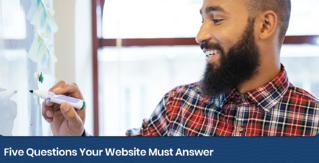 Learn more about the five questions every website must answer here. Although visitors are coming to your page to receive answers to questions, they do not need to find every single answer on your homepage. If you have too much information in one place, a visitor may be overwhelmed and choose to receive their answers from another company. The best course of action for your homepage is to keep it simple. Provide information that informs visitors they are in the correct place and information that helps them know what they should do next. Any information beyond that is distracting and could cause you to lose a new lead or customer. 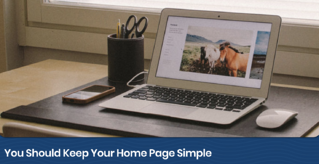 Learn more about keeping your homepage simple here. Your website is such an important tool for your company. It helps every department in your company and is often your first line of communication for new leads and visitors. By taking the time to create a well thought out strategy and plan for your current and future websites, you will be able to have a site that is high converting and produces new quality leads and customers. The best way to create accurate goals and strategies for a web design project is to know who you are trying to reach with your website. Download our free Buyer Persona template to get in the mindset of your ideal customer!